Sole S77 Treadmill Review by Industry Experts! 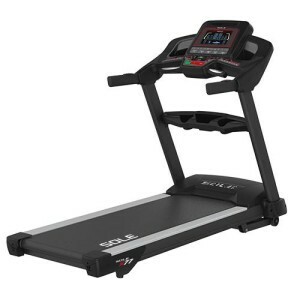 The Sole S77 Treadmill is On Sale! The Sole S77 treadmill is the non-folding version of the popular F85 and is built to take the abuse of serious users. It is equipped with quality components,and includes a large commercial grade 4.0 continuous duty HP motor, and a 60″ long and 22″ wide treadbelt. The newest 2017 model now has Bluetooth capability so you can track your workout stats using your smart device and monitor your progress. We’ve been fans of Sole Treadmills and Ellipticals for years and have made several trips to the headquarters in Salt Lake City. With each trip we come back knowing this company is obsessed with designing and manufacturing the most durable residential cardio equipment in the industry. It should be noted that the Sole S77 received a “Best Buy” rating from a prominent consumer magazine. They gave it an “Excellent” for ergonomics,contraction and exercise range. In fact, it came in 4th in the overall treadmill rankings. The three models that surpassed the Sole S77 cost considerably more. MID-WEEK SALE ENDS THURSDAY: The Sole S77 is ON SALE! The Sole S77 is priced at $1,899.99 with free shipping. An excellent value! Bluetooth Capability – Just download an app from Sole Fitness and you are ready to track your workout stats on your Sole treadmill. This latest 2016 model has Bluetooth capability that also syncs with other popular fitness apps. 4.0 Continuous Duty HP Motor — This is one of the largest motors you will find on a residential treadmill. It is built to run effortlessly at high speeds. 22″ x 60″ Treadbelt —If you are a runner and/or are tall, the extra length is a necessity. You get a 22″ wide belt, adding an extra comfort zone for running. A 22″ width is usually found only on commercial grade models. 2 ¾” Crowned Rollers — The large rollers extend the life of not only the rollers, but also the bearings and the belt. Crowned rollers, which are larger in the center, do a better job of tracking while further extending the life of the belt. Usually this is the size rollers you would find on a $4,000+ treadmill. Non-Folding Design — Most people who buy a treadmill of this caliber seldom require a folding function. The benefits of a non-folding treadmill are more stability and a solid feel. Combined with the 250 lb. unit weight, it would take a sumo wrestler doing interval training to rock this machine. We recommend you get the inside delivery option. This treadmill is a bear to move. A further benefit, machines without a folding mechanism have a reduced cost compared to those that fold. Wireless Heart Rate Control — Use your heart rate to get the optimum workout. HRC is used by many professional athletes. In the heart rate training mode, the machine will automatically adjust incline to keep you in your target heart rate zone. Built-in Speakers — These are not Bose quality, but it is nice having speakers directed right at you during exercise. You can plug in your MP3 or iPod player and not have to mess with headphones as you are sweating bullets. 250 lb. Unit Weight — The weight is equivalent to many commercial models and provides a very stable and solid feel; however you do not want to move this treadmill. Get the inside delivery option or you will be sorry. 10.1″ TFT LCD Console and Display — Sole put some thought into the design and layout of this console, and the result is one of the most stylish and functional displays on the market. Displays include Speed, Incline, Time, Distance Traveled, Calories, Pulse, and Pace. There is also a 1/4 mile track and a peak / valley graph that lets you visualize your progress. Furthermore, you have a built-in fan that efficiently targets your core. 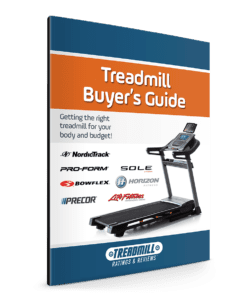 Warranty — You get a lifetime motor, frame, and deck, 5-year parts and 2-year labor coverage, which suggests the Sole S77 treadmill is built to last. If you are a runner, you’ll appreciate the extra long belt. This machine is excellent for sprints and interval training. If you plan to do some serious training, the 4.0 continuous duty motor will provide that extra power you’ll need. This size motor will never strain unless you are a sumo wrestler. This is a treadmill built for serious runners at a very reasonable price, and since it is non-folding, you will finding it slightly more stable than the folding F85 version. There are better treadmills out there, but they will cost $3,000 or more. The endorsement by a popular consumer magazine reaffirms the quality of the Sole S77. The addition of the Bluetooth technology for fitness tracking makes an already great machine truly excellent. I got my S77 about 2 months ago, and have used it constantly. It is quiet at anything under 10mph, changes speed and incline fairly quickly, and has quite a long running surface. I am 6’2″ and 250lbs, and it has no problem handling me. We’ve only had the treadmill for 4 months but already have 800 miles logged on it. I have no complaints and think it’s a solid performer… very sturdy deck, smooth tread, easy to use panel. I bought it for the durability for a runner and am more than pleased with this treadmill. It was easy to put together and I highly recommend it. Go to www.SoleTreadmills.com to learn more! Nice to connect. 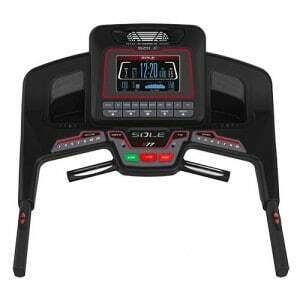 Sole is one of the most durable treadmills for the money on the market. I highly recommend Sole.